Baby do you wanna go? It is now fall star party season, and if you are a novice, at least as far as attending big, organized amateur events, you may be puzzled. Maybe a little apprehensive. Perhaps even scared. What do you take with you? How do you set up? This is ground we’ve covered here before, but it’s been a while, and my thoughts on the subject continue to evolve even after my years and years of star party attendance. Let’s begin with the most important thing, a CHECKLIST. Do you know The Eyepiece Guy? That legendary amateur astronomer, always the friend of a friend in the club in the next city over, who travels all the way to the Texas Star Party without his eyepieces? You don’t want to be that guy. He might be real, or he might just be the stuff of cautionary tales, but it could happen. Spend some time making up a checklist so you don’t have to be him. As you are packing your vehicle, actually check stuff off your checklist after—and only after—it is in the car. Which brings us to “Which telescope?” A telescope isn’t all you’ll need, of course, but it is sorta the most important thing if you, unlike a few folks I encounter at star parties, actually intend to observe, not just hobnob with your fellow astronomers. Anyhow, the answer to this one is pretty simple: a telescope that will be effective for the sort of observing you plan to do. If you think you want to hunt galaxy groups, don’t convince yourself your 4-inch C102 refractor will be adequate for the task because the skies will be so much better than at home. At a star party you can leave a telescope set up on the field for the whole event, no need to worry about hauling it back in the house when you are done, so use the biggest gun you’ve got if that fits in with your observing program. Just don’t let that telescope be a new telescope unless it’s a simple new telescope like a Dobsonian or a refractor on an unpowered alt-az mount. Most of the amateurs I see having gear trouble at star parties are those with complicated new scopes/mounts: “I didn’t get a chance to use it after it came; I figured I’d check it out when we got here.” Uh-uh. Combine an unfamiliar scope with the excitement and potential stress of a big star party and the result can be frustration and wasted hours under the stars. “Telescope”? Just one? Should you do telescopes instead? I’ve occasionally brought more than one instrument to an event. Usually a wide field refractor piggybacked on my SCT or a small standalone wide-field like the StarBlast. I’ve actually even used these instruments, since they provide different capabilities than my CATs or my 12-inch Dobsonian. The times I’ve taken a second telescope that didn’t do as good a job of of that, of supplementing the main rig, the secondary telescope has sat unused for the whole event. Take what you will need and use, nothing more. If you haven’t used your binoviewer in ten years, I think you can safely leave it at home. If you’re not sure what all you need, I strongly suggest you conduct a backyard observing run viewing the same sorts of objects you plan to observe at the star party. Even if you can’t see them very well from the back forty, this should give you an idea of the specific gear you need…eyepieces…adapters…diagonals…etc., etc. Before leaving home, double-check your accessory box (I use a big Plano fishing tackle box despite not knowing a spinning reel from a purple worm) to make sure all the items you’ll need are in it. I tend to use things at home in the backyard and then fail to put them back in the Plano. Triple check. Leave your red flashlight behind? A vendor at the star party can help you. Forget the SCT’s visual back? Might not be quite as easy to find one on the dealers’ tables (if there are dealers; they are becoming an endangered species at star parties). The IR filter you use in your camera? Uh-oh. Certainly you should take along plenty of Ds, Cs, AAs, and AAAs for whatever you have in your inventory that might need them, but I am specifically talking about 12-volt batteries to run telescopes, cameras, computers, and dew heaters. Yes, most star parties have some 120-volt AC available (don’t forget to take your extension cords and power strips), and if it is available I will run all my gear on it, but don’t expect it to be available. Sometimes there aren’t enough outlets for everybody, and if you are not among the first folks on the field you will get caught out. Take batteries (and chargers) sufficient to run everything and plan to run off batteries. These are things that are not quite astronomy-gear per-se, not telescopes or eyepieces or cameras, but which are still vital to your observing. An observing chair is at the top of the list. At a star party, you’ll hopefully be observing for longer stretches than you do in the backyard or at the club site, and you want to be comfortable so you can put in some hours. You’ll also need an observing table, something for your eyepiece case, laptop, and charts. 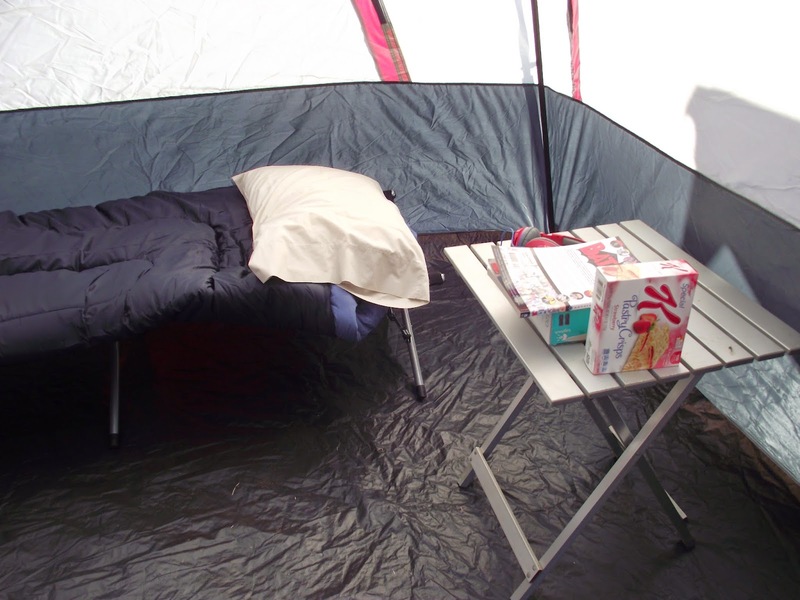 There are plenty of good, lightweight camping tables. Don’t scrimp on quality or size. You’ll also want something to sit on in the daytime. I favor inexpensive canvas folding camp chairs; you know, the ones that come in the nylon bags. Finally, and a biggie, is an EZ-Up, a tent canopy. That will keep the Sun off your head in the daytime and the dew off your head at night when you are not at the eyepiece. Ease of set up is a must, with the original EZ-Up brand and the Coleman canopies being at the top of my list in that regard. Most of us use computerized charts even if we don’t run the telescope with a computer. The laptop will also provide you with entertainment during the day or on (horrors) cloudy nights. You can watch DVD movies with it and even check up on Facebook on those blasted punk evenings if the star party site has wi-fi. As with the scope, plan on running the PC on batteries. The built in battery will not be enough, so pack a 12-volt battery and an inverter just for the lappie. Before enumerating what you’ll need here, let’s discuss the larger question “To tent camp or not to tent camp?” For the longest time, I eschewed tents. If there was even a 3rd class motel nearby, I’d stay in that motel. I'll still opt for a motel room if there’s a reasonably nice hostelry close at hand like a Holiday Inn Express or a Best Western. I have gotten tired of the el cheapos, though—the Days Inns and the Quality Inns and their brethren. I now find I prefer a tent to spending 100 bucks a night and wondering whether the bedbugs will bite. There is a third path, of course, star party cabins. Whether that is a better option for you than a tent depends on the star party. A tent is better than a bug infested chickie cabin, but there are events with not just bearable but excellent housing. Again, it depends on the star party in question. Ask around at the club and online as to the quality of the event’s accommodations and judge whether they are superior to a tent for the price. I prefer a tent sometimes, yeah, but it has to be the right tent. The right tent really has one major attribute as far as I’m concerned: you can stand up in it. If you can’t, you’ll get awfully tired of it in a hurry, I’ve found. Whether changing clothes or just arranging the stuff under the canvas, you need to be able to stand up to do those things comfortably. For sure, get a bigger tent than you think you will need. For one or two people, a five or six person tent, at a minimum, is good. Oh, you might be able to make do with a pup tent for a night or two, but you won’t be very happy with it. Almost as important as size is ease of set up. Remember, the tent will be but one element of your field setup along with the EZ-Up, the telescope, the observing table, etc., etc., etc. You want a tent that’s easy to pitch, even if you haven’t done it in a while. Especially if, like me, you occasionally arrive on an observing field as the Sun is beginning to sink. Luckily, there's no shortage of easy to pitch tent models these days and that doesn’t have to compromise their size or other features. Which particular tent or at least tent brand? You certainly don’t want to lowball it as low as you can go. BUT…you don’t have to spend for a tent suitable for an Everest expedition either. If you’re like me, you’ll probably use the tent two or three times a year at most, and something in the 150 – 200 dollar range is more than adequate. Which brand specifically? What still does it for me is good, old Coleman, and particularly their “Instant” series. While getting my Coleman up isn’t exactly instant, it’s easy enough, especially considering that it is a large cabin tent. At 150 bucks at Wally-World, one trip's use in lieu of a Days Inn room more than paid for it. What goes in the tent? Most of all, a sleeping bag. The main consideration here is one that is warm enough, but not too warm. It’s not a bad idea to have a couple of bags, one for spring/summer and one for fall/winter. Check the forecast and use the one that is appropriate for the temperatures you will face. Since, as with tents, it’s not necessary to buy one suitable for wilderness expeditions, you can afford two without skimping too much on quality. More important than the bag you choose, really, is what you put it on. What do you not put it on? The floor of the tent. Even with a pad, and even if you are young and hearty, the hard and cold ground will soon make you feel lousy. Much better is an air mattress—a real one, not an inflatable pool toy—but that’s still not good enough for me. I find I am more comfortable with the sleeping bag on a camp cot. I simply prefer being elevated off the ground. Cots that fold up and take up little room in your vehicle are plentiful and cheap. At the far end of star party season as December comes in, it’s possible you’ll find your tent too cold. I encountered that in Florida, believe it or not, last winter. The solution is a heater for the tent. You have to be careful, of course; you don’t want the tent (and you) to go down in flames. There are two alternatives. A catalytic heater or an electric heater. Catalytic heaters, which run on the little Coleman propane bottles, don’t have open flames so they are safe as far as fire goes. They do consume oxygen, however, so you need to have some ventilation. Many of the recent models will shut off or warn you if they detect a low oxygen condition. I use a catalytic heater under the EZ-Up, a Black Cat (Coleman) heater specifically, but I tend to use an electric heater in the tent. You need to exercise caution, sure, but electric models are available that are safe. What you want is one that automatically shuts off if it is tipped over. Never place it on the floor of the tent; only on a table. Do that and you should be good to go. If you’re in a decent sleeping bag, a little electric heater can keep you reasonably comfortable despite a tent’s lack of insulation. If you’re going to put the heater on a table, you need a table. I’ve got a couple of the small aluminum folding jobs sold in the outdoor departments of Wal-Mart, Academy, etc., and they work well in and out of the tent for a variety of uses at star parties. OK, you’ve got your gear packed with the help of your checklist and you are soon pulling onto that storied observing field. What next? Where do you set up? How do you set up? If you arrive early, you may have your pick of field positions. If so, go for one that is, above all, level. A scope, especially a Dobsonian, is happier on reasonably level ground, and your tent will be more comfortable if the floor is flat. Horizon? Depends on you. If I’ve got my choice of spots and one horizon is better from a particular field position than others (often because of the tree line on the edge of the field), I tend to pick a spot with a good view to the east, since it’s fun to do the "new" stuff on the rise. So, you pick your spot and assemble the telescope, the EZ-Up, and the tent. That’s, by the way, the order in which I do things. If I am running late, especially, the telescope is the number one priority. Get that put together, and I can observe and if necessary sleep in my vehicle on the first night. How exactly do you arrange your gear on the field? However you like as long as you don’t take up more than your share of space. At some star parties, you can have as much room as you want, but due to crowding at the more popular events, rules often restrict you. How will you know? In these cases you’ll usually find the organizers have marked off field spots in some fashion. Anyway, I like to set my tent up next to the EZ-Up and the telescope if that is permitted. Be aware that at some events a tent on the observing field is a no-no. At a few of the largest and most crowded star parties you cannot even have an EZ-Up on the field. Check the rules before you arrive. Once set up is done, you are likely going to be feeling a bit peckish. What do you do about food? If there’s a meal plan available, I invariably sign up for it. Star party food varies in quality, naturally, but I’ve never been to an event in all my years as an amateur where the food was completely inedible. It’s also usually cheaper to do the meal plan than eat at area restaurants, if any are available. Finally, it's fun to take your meals with your fellow amateurs. Some of my best star party memories are of fun and food with my compadres. If you want star party food, sign up in advance. Usually you can’t opt for the meal plan after you arrive (“Hmmm….the grub looks pretty good after all!”). No meals and no restaurants? You can always cook on the field. I’ve done that a time or two, and as long as there is water available for cooking and cleaning—and it would really be a primitive affair if there weren’t—it’s not bad. There are various strategies from MREs to electric hotplates, but my advice is to just invest in a familiar Coleman camp stove. Or not so familiar. Camp stoves are better than they used to be. Most feature electric start, and the nasty "white gas" they used to burn has been replaced by the same convenient small propane cylinders catalytic heaters use. You can get as fancy as you want, but I am good with a simple two-burner stove to heat soup, chili, and similar. I can exist on that for a few days , no problem. Back in my former life where I allowed myself to eat such things, I always had plenty of chips, cookies, etc. to supplement the canned fare. Today? Can of soup or Dinty Moore or Chef Boyardee spaghetti. Maybe a granola bar or some unsalted peanuts for late night snacking and I am happy enough. Really. What can make you tireder in the middle of the night than you should be? Dehydration. Bring plenty of bottled water (and maybe ice and an ice chest, too, if the weather is warm) with you and drink it frequently. I also find sports drinks to be efficacious. Tea and coffee have their place, too. And I’ll still drink a (low carb) energy drink when I need a boost. What is one thing I look askance at on the field? Alcohol. It ruins your night vision, and at a few star parties I’ve attended over the years it’s caused no end of trouble thanks to a few folks who didn't know when to say when. Save the booze for after the run is finished and don't annoy your friends if you've had a snoot full. Scope, tent, and EZ-Up are good to go. Your stomach is no longer rumbling. What’s next? You tour the field and hang out with and schmooze with your fellow amateurs. When evening comes, you observe like crazy for as long as you can go. When you are done, you cover the scope with a Desert Storm (mylar) style cover or similar scope cover, shut off the computer and whatever else you’ve got running, and head to the tent or cabin or motel. I mention this because some newbies are unsure what to do with the telescope at the end of the evening. Take it down each night just like at home and stow it in the car? That is not necessary at any star party I’ve ever attended and is one of the beauties of a multi-day event. Cover scope, go to bed, uncover scope the next night, observe again. Finally? Your star party won’t always be perfect. You’ll usually forget something no matter how careful you are, and the scope or some other piece of gear will invariably suffer some sort of hiccup. But I think you will find that even a slightly problematic star party is way more fun than sitting home, and will furnish you with some of the best memories you’ll have in your amateur astronomy career. If this season is your first fall star party season, all I can say is, “I envy you.” In a way you don’t know what amateur astronomy is really all about until you attend your first big one. Have fun. Only my favorite song ever. But they didn't collect much light. Thanks so much for this blog, I really enjoyed it and I shared it with my own compadres before we head out to our star party this weekend.